Cassidy's Ale House Sapporo Pint Night - Oak Beverages Inc.
Sapporo Pint Night at Cassidy’s Ale House, Thursday, February 28th, 6pm – 8pm. Join us for a pint of the #1 selling Asian Beer in the United States! 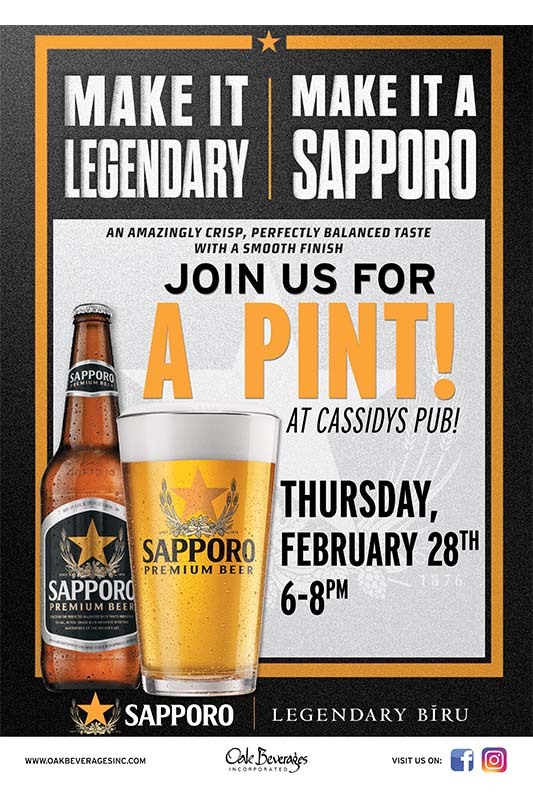 Cassidy’s Ale House Sapporo Pint Night, Thursday, February 28th, 6pm – 8pm. Irish American Pub & Restaurant. Serves breakfast, lunch, dinner, coffee and drinks. Posted in Featured Promo, Pint Night.